Cruise fans have a slew of new ships to evaluate for a future cruise. Freelance contributor Georgina Cruz just returned from a brief preview cruise onboard the luxurious Seabourn Sojourn and she gives readers her feedback about this second Odyssey-class vessel. 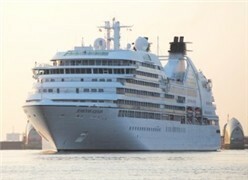 While the ship will cruise worldwide in 2011, it will sail two Caribbean cruises and a transatlantic cruise from Port Everglades in winter 2012.